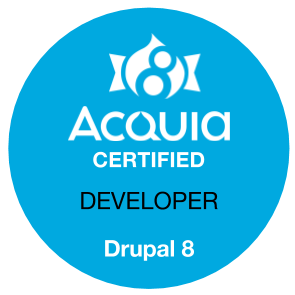 The Acquia Certified Developer exam is a general purpose test that covers the topics you need to know to build a custom Drupal 8 website on your own. The exam covers building websites with the admin interface, as well custom module and theme development. The topics are wide-ranging. The Acquia Certified Developer - D8 exam targets 4 domains like Fundamental web concepts, Site Building, Front end development (theming), and Back end development (coding). This exam is based on Drupal 8 platform. All of these topics are also tested on the Certified Site Builder exam. The questions on module and theme development are fairly basic. If you've built a few custom modules and a custom theme or two, you've probably used all the of the APIs and techniques you need to know. I also suggest you go through Acquia's study guide for the exam. It has links to documentation for all the topics that may show up on your test. Inline CSS takes precedence over any other CSS (outdated form of styling, typically still used in email templating). More specific selectors take precedence over less specific ones. ID selectors take precedence over class selectors. Review the jQuery Api docs for examples of jQuery methods. For example: .filter, $( document ).ready() and some other methods. Git is a version control system (VCS) that keeps track of istory and changes to source code. For example: git pull, git fetch, git status, git clone, git fork, git commit, git add, git push and git rebase. The base configuration of a content type defines the default behaviour and properties of the content type. Read about View Modes and Form Modes. Form Modes is new in Drupal 8 and you can find some question related to this as well. Read about Taxonomy creation and uses of it for organize content. Review how blocks in Drupal 8 are fieldable and can be placed in multiple different regions instead of only one region. Check details of Menu system and creating new Menu types. Views is now in Drupal Core and it is really important for all type of websites. Read about creating Blocks, Pages and several other view types. In Drupal 8 most configuration is found in yaml files that you can import and export from a site. Read about it in details. ow to start a site with a new default language. Review how to configure multilingual entities. Review Twig multilingual manipulation. Web services are now included as a part of Drupal core. After enabling the RESTful web services you can expose entities and other resources as RESTful web API. Read about Theme Creation, Default Sub Theme, Usage of Sub Theme. Check basic CSS file structure, for example: base css, layout css, fields css etc. Twig is now the default template engine for D8. Check the twig syntax and its functions. Read about Theme suggestions, overriding it with naming conventions and hooks. Read the OOPS concepts like Base Class, Abstract Class, Interface, PHP Constants. Create Modules with Forms, Content Page, Blocks etc. Read about creating Configuration forms and set and get methods for configurations. Read about Drupal coding standards for Drupal 8, since Drupal 8 has yaml and twig files. and supports annotations, you should be aware about these points. Read about caching, Dynamic Caching and other performance related stuffs. You should have the ability to analyse the queries and understanding of SQL injection attacks. You will find all these pointers in your Acquia Certified Developer exam. So, try to work on all these pointers before you go for this exam. Share your points in the comment section. Casting out Caste System: Can You? Copyright © 2017 www.pranitjha.com. All Rights Reserved.